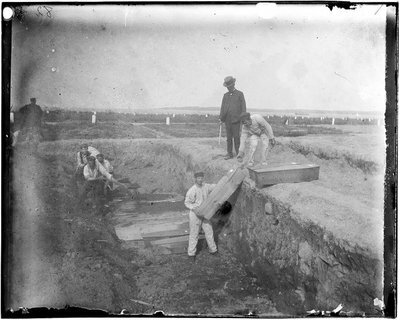 Pictured above: Workers filling a burial trench at the potter's field on Hart Island, circa 1890. The seaside of the Long Island Sound is home to many mysterious locations, and Hart Island is at the center of one of its darkest untold stories. Hart Island, sometimes referred to as Hart’s Island, is a thin, half-mile long strip of land at the western end of the Long Island Sound which serves as a mass grave for New York City, and is the largest mass grave site in the United States. This gravesite is known as a potter’s field, because it is a common, tax-funded gravesite used for burying an area’s unidentified or unclaimed bodies. Over 900,000 bodies were interred at Hart Island since 1869 – most of those being individuals who were homeless or unclaimed residents of New York City, or infants whose parents could not afford a burial. Throughout its history, the 130-acre island has been used as a prison camp for thousands of Confederate soldiers, a workhouse, a women’s asylum, a sanatorium, and a Nike missile site during the Cold War. Since its start as a prison camp, people began using the island to bury the unknown or unclaimed en masse. To this day, Riker’s Island inmates still inter 1,500 unclaimed bodies on the southern portion of the island every year. From 1980 to 2011, daily burials were conducted at the gravesite by prisoners from Riker’s Island, who were paid 50 cents an hour to dig graves and stack wooden boxes in groups of 150 adults and 1,000 infants. The prisoners were also the only ones to leave memorials at Hart Island, including crosses made of twigs and small offerings of fruit or candy. Hart Island has been closed to the public since 1976, and is controlled by the New York State Department of Corrections. Some parents of many of the infants buried on the island have sought legal action to have the right to visit the grave of their child, but clear laws are yet to be established allowing them to have visitation rights. Currently, visitation is limited to the third Thursday of each month, and visitors to the island can only go to a gazebo near the ferry dock. Even relatives of those buried on the island are not permitted to go to specific gravesites. In order to go to Hart Island, one must receive permission from the state prison system. If you believe that you or someone else knows an individual who may have been buried on Hart Island, The Hart Island Project is available to provide information regarding burial records on the island as well as the general area of individuals’ gravesites. The Hart Island Project is also working towards making the historic island a public area to be operated by the state parks department, much like other cemeteries.